If making your own pie dough, combine the butter, flour, salt and black pepper in the bowl of a food processor. Pulse until small pieces form. While pulsing the food processor, add the cold water (Tip: put the water into a cocktail shaker with ice and give it a good shake to keep the water super cold!). Continue pulsing until dough just comes together. Pour it out onto a slightly floured surface and press it into a round flat disk. Wrap the dough in plastic and let it chill in refrigerator for an hour or up to 24 hours (or freeze it for later use!). For the filling, melt the butter in a large skillet over medium heat. Add the apple, onion and squash and season with thyme, sage, salt, pepper and nutmeg. Cook to just tender, about 15 minutes. Let cool a bit. Roll the pie dough out into a large circle on a floured surface to about 12- to 13-inches in diameter and 1/8-inch thick. Place on parchment on a baking sheet and arrange the apples and squash, slightly mounded in the center, leaving a two-inch border around the edges. Fold in the edges, overlapping as you tuck and turn the galette. Pre-heat the oven to 350°F, placing a rack in the center of the oven. Bake the galette for 30 minutes; brush the edges with egg wash and bake for 15-25 minutes more, until the crust is deep golden. Serve topped with blue cheese crumbles and drizzled with honey. In Recipes-list.com we have selected the most viewed recipes from category - uncategorized . Enjoy the best recipes specially selected for you! 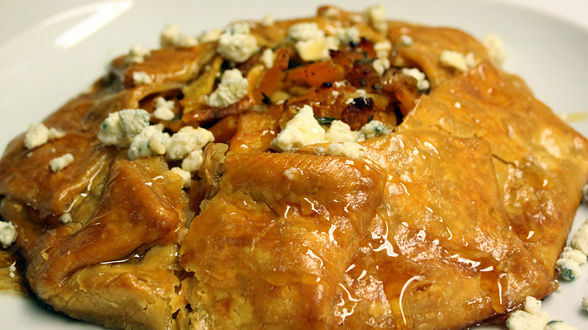 Butternut and Apple Galette is the right choice that will satisfy all your claims.